Colour is made up of three primary colours, three secondary colours, and six tertiary colours. 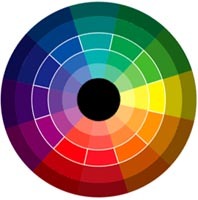 Colour harmony is based on which is based on the twelve colour wheel of 'true' colours. Each of the twelve are modified by the addition of white, grey or black. The choice of colours by a florist is the most fundamental aspect of floral design. Colour suggests emotions and influences how we view things. For example red is evocative of love, red and green suggests Christmas time to us, and yellow can evoke thoughts of Easter. The choice of colour is vital for florists. Colour can be soft and gentle engendering a sense of calmness. Warmth and vitality can be suggested by vibrant colours. Colours interpret and convey. It is a good idea for florists to make their own colour wheel using water-colour paints. The only colours needed are, the primary colours, red, yellow and blue, plus black and white. Create a large white card circle and mark it out with 'spokes' into twelve equal segments. Then moving out from the centre draw three equidistant circles. This will leave each pie segment with four sections. Working from the outer segment towards the centre. these are for hue, tint, tone and shade. Mix the water-colours to produce the right colour for each segment. When the colour wheel is complete separate cut-outs can be made for each colour harmony so that when a cut-out is placed over the colour wheel a harmony is readily identified.